Chamomile is a great way to brighten dull blonde hair color. Using a chamomile hair rinse several times will brighten those locks in no time! 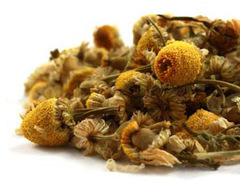 For a cost effective way to use Chamomile, use fresh herbs instead of the essential oils. As herbs can cost around $9 and up, some EOs will run upwards of $20. Add a Chamomile tea infusion to your shampoos. Chamomile works best for natural blondes, not matter what level. Use this to add subtle highlights. To Use: Shampoo and condition hair as normal. Tip head over bathtub or sink. Use a bowl underneath to catch the liquid. Pour the tea through towel-dried hair a few times. Leave on hair for 30 minutes, then rinse with clean water. To Use: Spritz into clean damp hair. Sit out in the sun and apply again as hair dries. Great to use while sitting by the pool or at the beach. Steep the tea and water in a covered pan for 30 minutes. Strain and allow to cool. Mix with remaining ingredients then add to a empty, clean shampoo bottle. Steep 1/2 cup of the chamomile flowers in 6 cups of boiling water for 30 minutes. Strain the tea, and allow to cool. For a stronger brew, repeat this process. Pour into a bottle. Add oils. Shake vigorously. Apply to damped hair, place plastic cap on hair, allow to set for 30-45 minutes. Shampoo hair then condition as normal. Honey contains natural Hydrogen peroxide. Iron in honey oxidizes the oxygen free radicals released by the hydrogen peroxide. Honey will also remove chemical hair color and henna over time with several applications. Honey is non-damaging and can add great shine to your locks!. Mix 3/4 cup honey with 1/12 cups regular hair conditioner. Apply to damped hair. Wrap hair in saran wrap or a plastic shower cap. Let sit for up to 8 hours, then rinse. Mix together. Apply to damped hair. Wrap hair in saran wrap or a plastic shower cap. Let sit for at least an hour. You can even sit in the sun. Rinse and shampoo. Lemon. 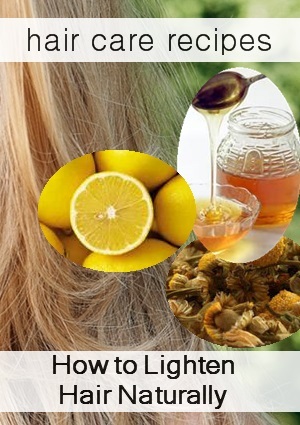 Who hasn't tried lemons to lighten their hair! You can use the juice from fresh lemons or an easier way is to buy the lemon juice concentrate from the store. Lemon is VERY drying. You should always mix the juice with a little oil such as olive oil or even conditioner. And always deep condition well after rinsing. Lemon to lighten hair is best when you are sitting in the sun. 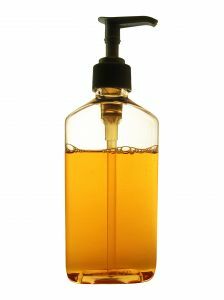 Spritz hair with 1 part lemon juice, 2 parts water and 1 teaspoon oil. Rhubarb to Lighten Hair: To lighten your hair, mix 1/4 cup of chopped fresh rhubarb to 2 cups of boiling water. Cool the mixture, strain, and use as a rinse after shampooing and before conditioning. If you're looking to add highlights to your hair, brighten your natural color or help remove or fade artificial hair color, there are many methods you can try. The herb Chamomile is best when used on blondes who need to brighten their hair color and maybe add a few highlights. Lemon juice works well to remove hair color gradually. And to add reddish highlights to brunettes. Honey, as it contains peroxide, has also been used for centuries to brighten up hair color. Blondes will see dramatic results with lemon juice. Brown and Dark Brown hair will see reddish highlights. But if you tend to get blonde highlights around the face naturally, you'll see even more with lemon juice. Using lemon juice to remove or fade artificial hair color: This method works great if your color turned out too dark and you need to quickly fade the hair color. Herbs, roots and flowers can also tint and lighten blonde hair.